Hand trucks are called cart, dolly or trolley. 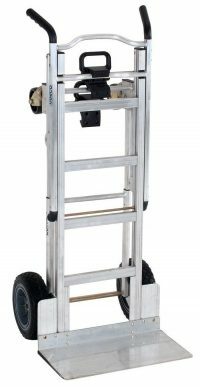 Hand trucks generally have an L shape, with the handle at one end, wheels on the other end supporting a deck or platform. There are two variants of hand trucks: 4 wheel cart and 2 wheel dolly. 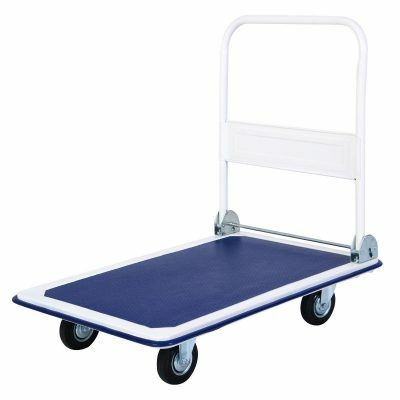 On a 4 wheel cart, heavy items are loaded on the platform which then can be easily transported. 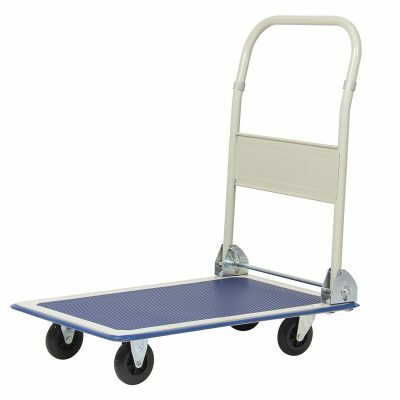 In case of a 2 wheel dolly, the platform is placed under items to be loaded, which then allows easy maneuvering. The cart has a sturdy and reliable build made from steel. The platform is textured resulting in a slip-resistant surface that can support the load of up to 600 lbs. The deck has rubber bumpers and rounded corners that help in buffering collisions. The cart has 4 wheels and swivel casters that provide stability and easy maneuverability. It has a foldable handlebar that makes it compact and very convenient to store. The cart also has a foot bar release that allows to lower the handle and lock it in an upright position. The cart is super easy to fold into a compact size. It is lightweight weighing up to 4 lbs, can be easily carried in a backpack without feeling heavy. The drawbar is made of durable steel which is sturdy and does not shake when being pulled after the platform has been loaded with heavy items. The cart has highly durable tank wheels which are wear-resistant, silent and long-lasting. The truck comes with a fat bungee cord which is perfect for tying and carrying large size boxes, packages, and other heavy items. The cart comes with a large base plate made of high-quality PP plastic making the base very sturdy to hold large sized heavy stuff. The base plate is highly durable and does not shake when pulling the cart. The lightweight cart does all the heavy lifting. It easily transitions between 2-Wheel Upright Mode, Assisted 4-Wheel Hand Truck Mode, and 4-Wheel Cart Mode, with just one hand and requires no tools or pins. The cart has 4 flat free rubber wheels for easy hauling without causing any muscle strain or back injury. The cart is 30% lighter than steel as it made of glass filled nylon plastic frame. The unique frame is designed for maximum strength. The cart has 10-inch all-terrain wheels and 5-inch swivel casters for easy maneuverability. The cart converts easily from a 2 wheel dolly with 600 lbs load capacity to a 4 wheel cart with 700 lbs capacity. The telescoping handle has built-in stair glides for easy moving up or down stairs and curbs. The cart is engineered to have high endurance so that can easily move heavy items. It has a robust construction with a rugged steel frame. Its load capacity is 150 lbs. Surprisingly, the cart is very lightweight weighing only 9 lbs. The easily fold-able frame collapses to just over 2 inches thick. Additionally, the 5-inch rubber wheels are retractable so helps in easy folding. The cart unfolds instantly with the touch of a button. With the cart it is incredibly easy to move things around, making moving a hassle-free, and easy experience. The cart is slim, lightweight and compact allowing it to be stored anywhere. The cart dolly is moved small and large items with incredible ease. So you no longer need to stress your back while moving items. The cart is 28.5 inches long, 18.5 inches wide and 5 inches tall. It can support up to 300 lbs. The cart has a textured platform which allows extra grip for the loaded items so that they do not slip over. 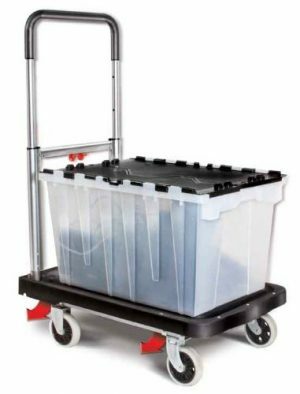 The top handle of the cart easily folds down allowing it to be stored easily. The cart itself is lightweight, weighing about 16.5lbs. It is simple to assemble, and easy use and store. The cart sports four wheels at the bottom for four points of stability and excellent rolling power over different surfaces. The cart also comes with swivel casters that can be placed at the same end as the handlebar to use the cart as a pull cart instead of a pushcart. The frame of the cart is made of durable stainless steel and lightweight aluminum. 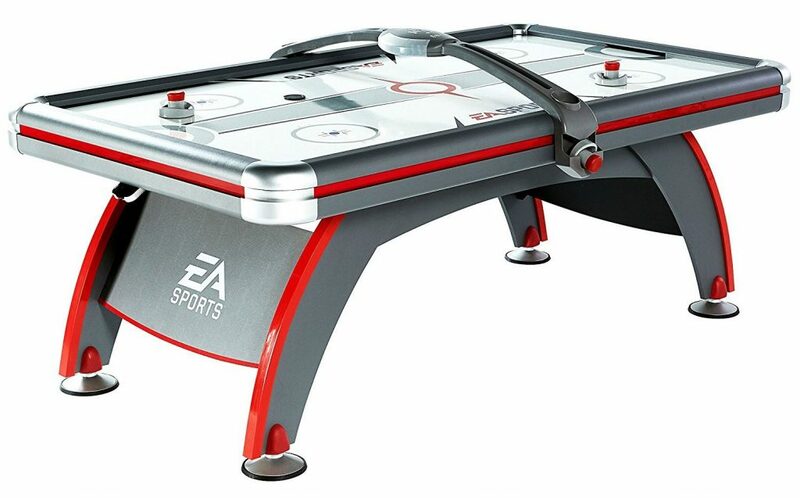 It has a polypropylene deck that is 27 inch by 16 inches. The platform is an ideal size for hauling different items without straining the back. When fully assembled the cart has a capacity of 300 lbs. The 4-inch rubber wheels (require no air) imparts four-point stability to the cart that ensures a smooth transport of bulky objects. The wheels do not leave behind any mark. The front wheels are designed to rotate full 360 degrees for exceptional and easy maneuverability. The handle telescope and extends up to 36 inches. The cart is perfect for any vehicle, office or home environment. It is lightweight, weighing around 15.5 lbs, can be folded compactly to 3.5-inch thickness. As it requires minimal space it can be easily stored in the car, in a closet, or behind doors. Also, the cart has retractable wheels making it super easy for storage. This cart has a unique I-Beam Steel-Tough nylon truss frame which is 30% lighter than steel. The frame is durable, built for maximum endurance. As a 2 wheel dolly, it can support 300 lb weight and as a 4 wheel cart, it has 400 lb capacity. The frame is resistant to chemicals, corrosions, and rust, which ensures it a longer life. The cart requires assembly of base plate and wheels. The cart has 8-inch wheels with solid rubber tread and 3-inch casters. The handle telescopes into three positions and the cart have built-in stair glides for easy moving up or down stairs and curbs. 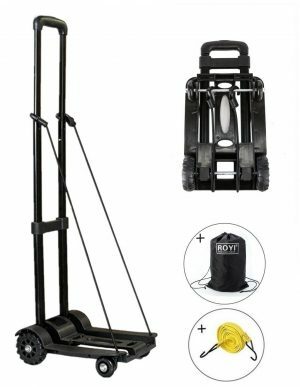 This sturdy dolly from Cosco effortlessly converts from a 2-wheel dolly to a 4-wheel cart with the pull of a simple handle. The transformation is quick and simple without the use of tool or pins. It can support 300 lbs of weight. It has a unique and innovative flat fold design allowing it to be most conveniently stored in an average size car trunk. The 4 wheel dolly is convenient for stacking up and hassle-free transport of large items. The 2 wheel cart can conveniently transport heavy goods across large distances without any back strain. Magna cart is made up of lightweight aluminum. It has a 15-inch aluminum base, 5-inch flat free rubber wheels and a telescoping handle which extends up to 39 inches. It folds into a compact size that is 2.5 inches thick, making it ideal for air travel. The cart can support 150 lbs of cargo.